Moral corruption and objectivity is the latest victim of the US-Arroyoâ€™ regimeâ€™s propaganda in the Philippines. It is really unnerving that even the mass media including the ABS-CBN News, the Inquirer Publishing Inc. and others who cannot get their facts straight. It is but fine for the military and police in the Philippines to diminish the effect of the mass actions in the Philippines by under estimating the peopleâ€™s turn-out, but for the media to quote police estimates and fail to make its own estimates really makes people sad. To the AJLPP based in the United States, this means they even failed to count the number of people who attends rallies honestly. 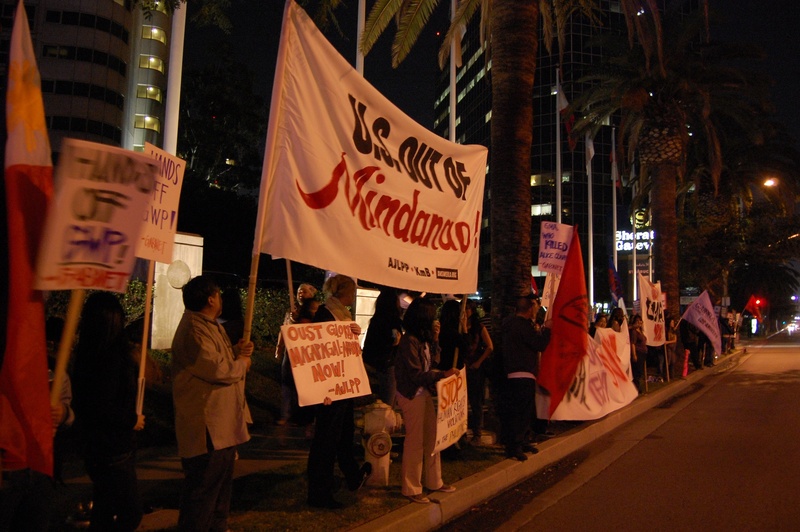 Los Angeles- Moral corruption and objectivity is the latest victim of the US-Arroyo’ regime’s propaganda in the Philippines. It is really unnerving that even the mass media including the ABS-CBN News, the Inquirer Publishing Inc. and others who cannot get their facts straight. It is but fine for the military and police in the Philippines to diminish the effect of the mass actions in the Philippines by under estimating the people’s turn-out, but for the media to quote police estimates and fail to make its own estimates really makes people sad. To the AJLPP based in the United States, this means they even failed to count the number of people who attends rallies honestly. But in spite of all the wild guesses, the Alliance-Philippines (AJLPP) based in the United States and the Filipino American community strongly and militantly commends the latest mass actions on December 12th against the charter change in the Philippines. We stand in militant solidarity with stalwarts of the opposition in the Senate and all the progressive lawmakers for standing up against tyrant puppet of the US Imperialist Gloria Arroyo and her cohorts. We in the AJLPP join the Filipino peoples demand that the imperial and fascist presidency of Gloria-Macapagal-Arroyo be ousted. The AJLPP also pays tribute to the more than 1,200 victims and martyrs who were killed by the regime and to the very many in jail and are still missing. The AJLPP is happy with the latest development that the broad united front of the religious, opposition and democratic forces is actively moving against GMA’ s charter change schemes. OUST GLORIA MACAPAGAL ARROYO, NOW!